Stroll down the road from Bruichladdich and you’ll end up at Port Charlotte. 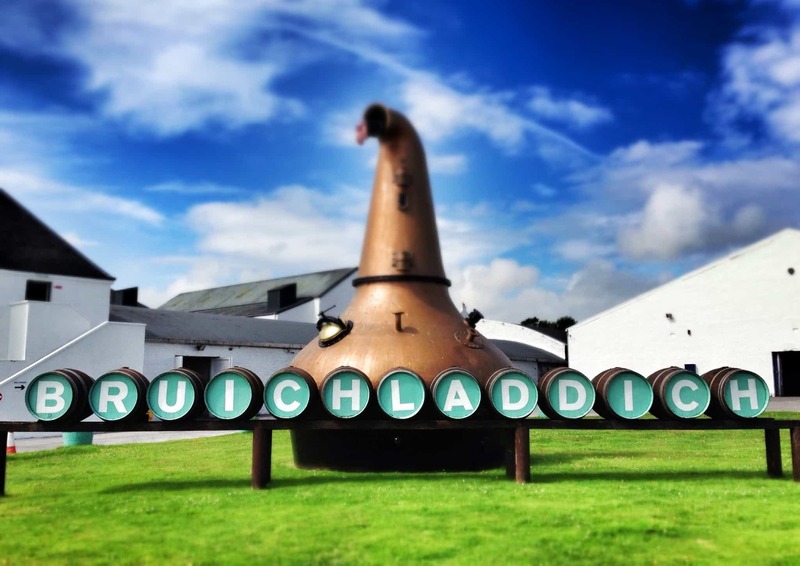 It used to be known as the Lochindaal distillery from 1829 to 1929 before it closed down. 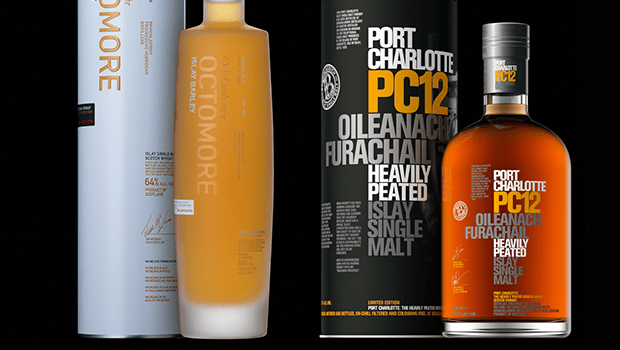 A decade or so ago, Bruichladdich resurrected it, and have since used it as one of their two peated whisky brands (the other being the mighty Octomore – the world’s peatiest whisky). Though the distillery isn’t actually fully built yet, apparently (if my Google-fu is strong), the investment from new Bruichladdich owners, Rémy Cointreau, will mean that the new Port Charlotte distillery will be completed in about four years from now. So if the distillery at Port Charlotte isn’t physically distilling the whisky, it is at least being used to store it. And I’m all over that. Though Heavily Peated, it’s peat levels are around 40ppm, which puts it around the level of Laphroigs, but of course isn’t near the level of the Octomore range which goes into the 160s. The 10 Year Old (note: not the PC10) is bottled at 46% ABV and will cost around £40. As with all Bruichladdich offerings, it’s non-chill filtered, and has no colour added to it. Colour: a reddish-brown tint, almost ale-like. On the nose: the smoke is akin to the insides of a well-used wood-burning stove – perhaps a little coal has been used in this particular one. And all of this is really before you even get close to the glass. Up close, you realise this isn’t smoke cloud but something much more tender and sweeter. Two bold notes at first: the peat smoke and the sweetness. Lemon drizzle cake. Faint trace of cloves. A vegetative, chamomile (the plant, even the tisane, not the ropey tea bags) note that leads of the citrus. In the mouth: of all things, it’s the balance that strikes first, so much so that you have to think about which flavours to then hunt down. The most bitter of chocolate sauce, with a little crème fraîche. Buttery. Earthy, woody. A kind of sweetness you get with caramelised onions. That smoke seems so ingrained in the whisky: it doesn’t overpower, it just seeps quietly into every drop. Fascinating stuff. Briny towards the finish. Thick, but not at all oily – that said, perhaps it doesn’t quite have the same immense viscous texture of some of the other Bruichladdichs (but maybe that’s not the point of this whisky). It does leave room for the elegance to shine through. 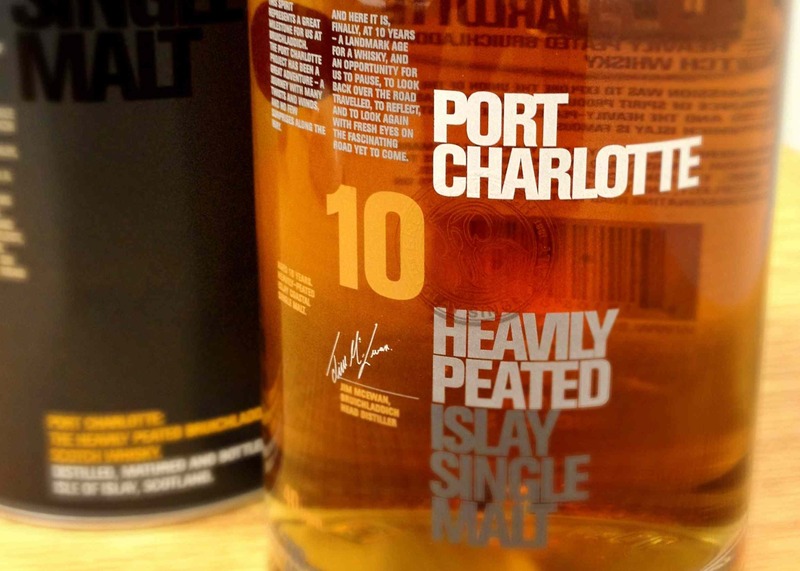 What impresses me greatly is that, despite the number of peated whiskies produced on Islay, the Port Charlotte has managed to find its own very unique flavour. This is pure, primitive stuff: fire, bracing coastal walks, simplicity. Very elemental. Soothing and calming. Though there’s a great deal going on, it’s very much a stripped-down way of doing things, like when you have a holiday where there’s no Internet connection or phone signal, just the bare essentials, and there’s a lot to be said for that, as it reminds you of what’s important. Personally, I’ve preferred the Octomores, but those are extra special limited releases, and at a much higher strength. There’s no point comparing them as this is a new standard release from Bruichladdich – it’s here to stay. If you were going to have a everyday peated whisky to have on the shelf to get you through the winter months, and at a very attractive price, then this is exactly what you need. Sounds nice, guess I have to check it out soon. Definitely. I think it’s one of those that can easily stand alongside the Laphroaig 10 and the Ardbeg 10 – which is saying something, as those are both terrific drams. I just had to buy a bottle of this after I had a taste of it. Terrific whisky. I’d position it somewhere between Longrow CV and Ardbeg Uigeadail looking at the sweetness and peat. The thickness is also something I noticed, I tried a few other (peated) whiskies after the Port Charlotte and they just felt “thin”. Glad you liked it – and that’s a good call for it being between Longrow CV and Uigeadail. Bruichladdich must have some magic stills for creating that really nice texture!